Providing the Central Virginia area with professional, fast and eco-friendly junk removal services. 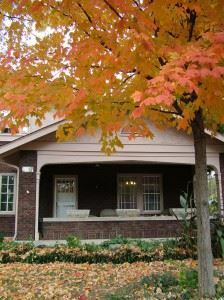 Will Your Home Be Ready For Fall? The big priority is getting your rain gutters cleaned. This is a somewhat arduous task that requires a ladder, a pair of work gloves and plenty of trash bags. It might work best as a two-man operation. One person goes up the ladder while the other one holds the bag down below. Once the rain gutter is clear, you might want to hose it down and make sure the spout is flowing as well. Cracks in the foundation can be structural or cosmetic. If you see a crack, then it’s a good idea to patch it up. If this is something that’s outside of your handyman wheelhouse, then bring in a professional contractor who knows their way around patching cement. A fireplace is a great feature for any home. But if it is full of ash and soot, then it’s not going to be a very pleasant experience to light a fire in there. There are some brushes that you can use on your own to clean out the chimney from inside the living room. This can be a very messy proposition, which means make sure everything gets covered with old sheets or plastic. Your furnace needs to be in proper working order. You’ll notice when you turn it on for the first time there might be a funky smell coming from the vents. That should clear up very quickly. It will help to make sure you keep the vent filters clean as well. As for this furnace itself, if it hasn’t been professionally serviced then you should definitely consider contacting the company who installed in the first place and have them come do a cleanup job. Getting rid of rubbish is another good idea to do in the fall for the hot they start. That rubbish can take on many forms from yard debris to unwanted clutter from your garage. Go through your entire property and identify the things you want taken away then give Junk King Richmond a call. They’ll spring into action and dispatch a team of movers and truck to your location for fast junk removal. It’s the easiest way to handle this big type of job. Start the fall with a serious junk removal session from Junk King Richmond. This entry was posted in Richmond Junk Removal and tagged clutter, fall, home, rubbish on September 1, 2017 by Junk King. Last updated September 1, 2017 . Do You Need A Junk Hauler?